20 Minute Pasta Carbonara. 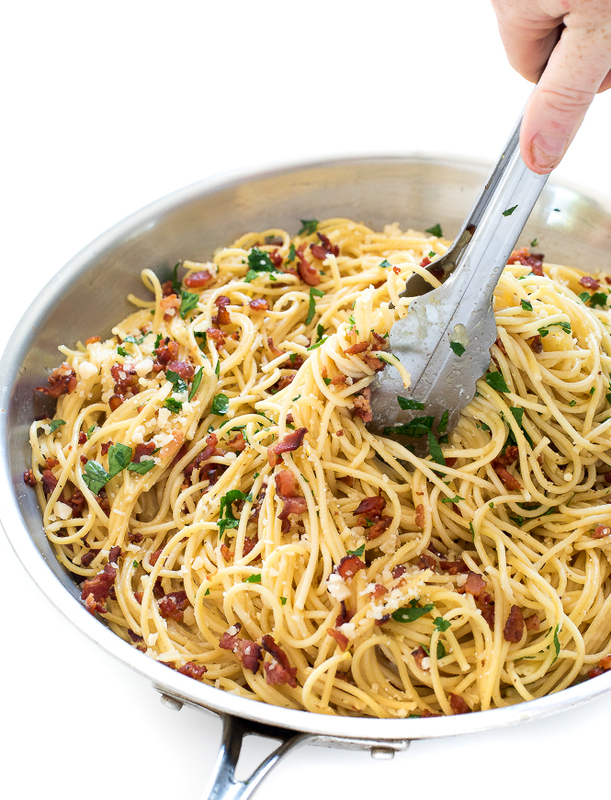 Pasta coated in a thick egg sauce with bacon and parmesan cheese. 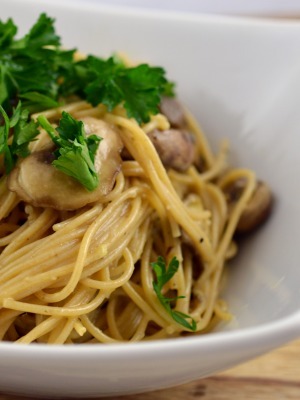 A super easy weeknight dinner! 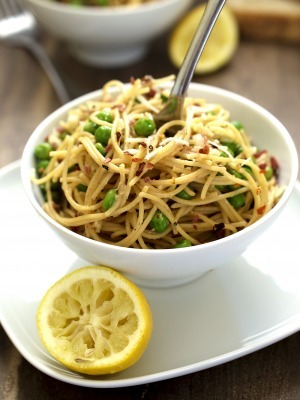 Pasta Carbonara is such a simple yet delicious meal. Eggs tossed in hot pasta to create a thick sauce sprinkled with freshly grated cheese and smokey bacon. This dish comes together in less than 20 minutes. While the pasta is boiling I cook the bacon and shred the cheese. When the pasta’s done I reserve some of the water and toss in the raw eggs, parmesan cheese and bacon. The trick to making Pasta Carbonara is to start with room temperature eggs. This helps to keep your sauce smooth and clump free. Also to avoid scrambling the eggs it’s very important to take the pan off the burner when adding the eggs. 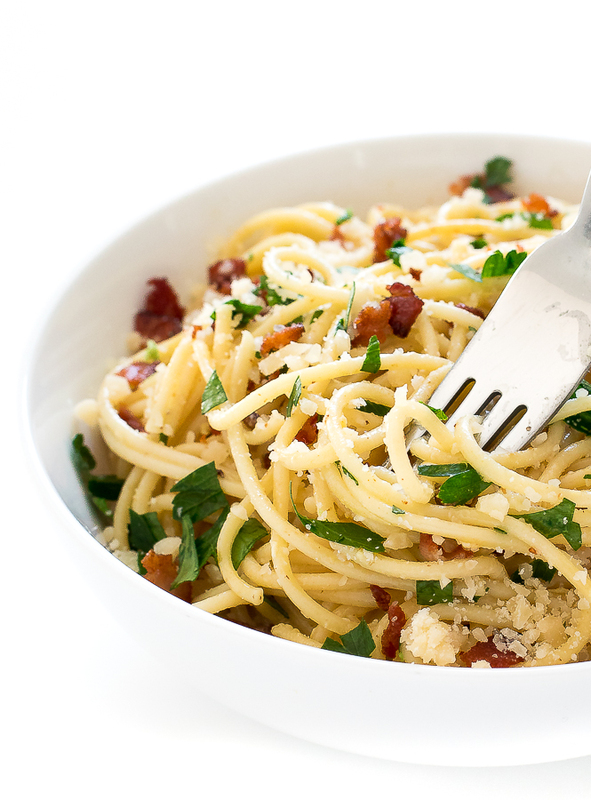 Pasta Carbonara is best served immediately with fresh chopped parsley for garnish and extra parmesan cheese for serving! Boil the pasta per package instructions until al dente. (Mine took 9 minutes). Meanwhile in a large skillet add cubed bacon and cook over medium high heat until golden brown. Add in garlic and cook for an additional minute. Turn off the heat and set aside. In a small bowl whisk eggs and cheese together, set aside. When pasta is ready drain and reserve 1 cup of the pasta water. 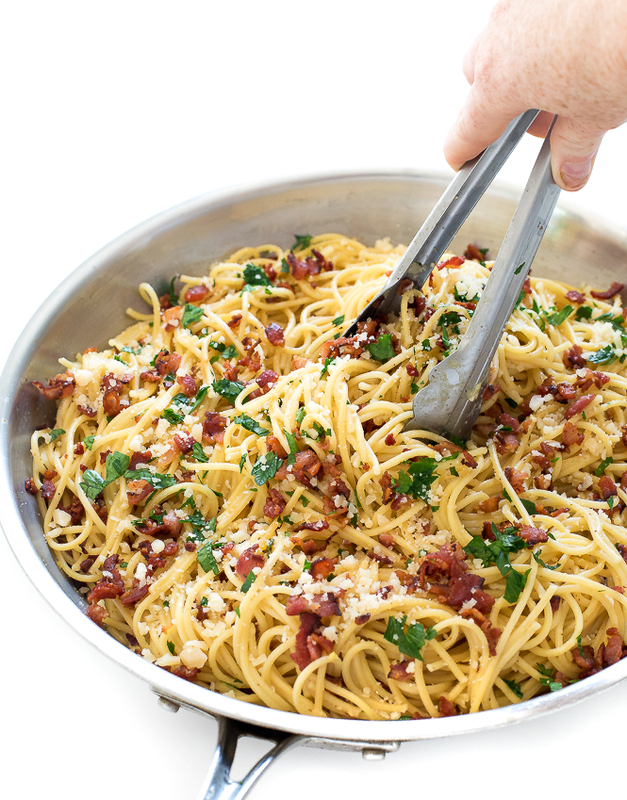 Add the pasta to the skillet with the bacon and garlic mixture. Add in the egg / cheese mixture and 1/2 cup of the pasta water. Slowly toss the pasta until the pasta is coated. Add more pasta water if needed. Serve immediately with fresh chopped parsley and additional cheese if desired. Beautiful! I really love the photos! Do you drain the bacon grease before combining everything? No I leave the grease in the pan for extra flavor.